Surfing the internet this morning and found out that Luxembourg is the world's safest city! Swiss cities however, lead the way for combining safety with high quality of life, according to a quality of life survey by Mercer Human Resource Consulting. The Swiss cities of Bern, Geneva and Zurich ranked just behind Luxembourg for safety, along with the Finnish capital, Helsinki. The safety survey evaluated 215 locations for crime levels and internal stability. In the United States, the five safest cities tied in 45th place: Honolulu; Houston; Lexington, Kentucky; San Francisco; and Winston Salem, N.C. New York was 58th, while Atlanta had the lowest U.S. ranking at 90. Meanwhile in Canada, Calgary, Montreal, Ottawa, Toronto, and Vancouver rank jointly in position 18 with scores of 112. In Britain, the top-ranked city as far as safety is concerned is Glasgow, Scotland (39), followed by Birmingham (51) and London (69). On the bottom of the list is the Iraqi capital, Baghdad, which is the world's least safe city, followed by Abidjan, Ivory Coast; Bangui, Central African Republic; the Nigerian cities of Port Harcourt and Lagos; and Bogota, Colombia. In its overall quality-of-life survey, Mercer evaluated 39 criteria such as crime, health, education and transport. 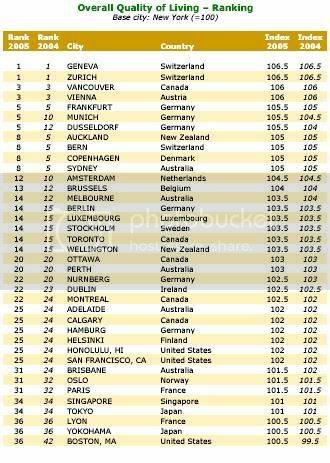 Other cities at the top in that category are Auckland, New Zealand; Bern; Copenhagen, Denmark; and Sydney, Australia. Honolulu and San Francisco ranked highest in the United States at joint 25th, while New York and London tied at 39th. In Asia, the top three cities were Singapore and Tokyo, both 34th, and Yokohama, Japan (36). 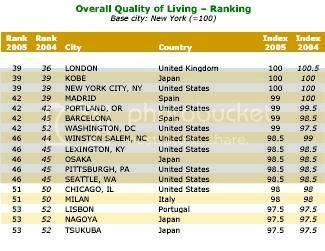 In South America, the top quality-of-life cities are Montevideo, Uruguay (76) and Buenos Aires, Argentina (78). Looks like our neighbours Singapore maintained their position on 34. I wonder how Kuala Lumpur did? Should be in the top 100 (Ranked 84 last year). Anyone knows? - Luxembourg scores highest for personal safety and security; Baghdad scores lowest. - Canadian cities top the rankings for safety and security in North America. - For overall quality of life, Geneva, and Zurich rank top; Baghdad scores lowest. wayo, hehe, Frankfurt scores high. My original hometown. May be it improved AFTER I left? hahaha... maybe that's why KL is not on the list? Top 50 best cities to live in wayo, hehe, Frankfurt scores high. My original hometown. May be it improved AFTER I left? hahaha... maybe that's why KL is not on the list?